Posted on 6/5/2012, 8:51 am, by rackycoo, under General Projects. cinnamon teal created this striking monogram using her and her husband’s initials. Doesn’t it look great sitting on their mantel? Here’s something I made for my Dad, who always has a tin of Altoids in his car. He asked me to decorate one, so I used a map to give it a travel theme. 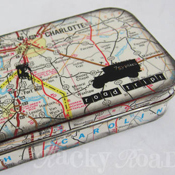 Road trip altered tin, by rackycoo. Everyone loves getting personal mail. Anything other than bills or ads is exciting to receive! 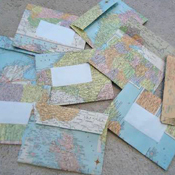 Have your personal mail stand out by creating colorful envelopes from maps, like these by psyche. 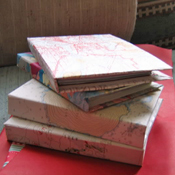 I think this is the perfect use for old maps: covered travel journals. 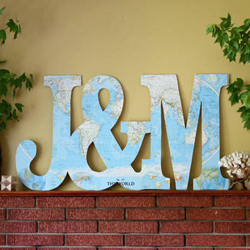 What a great way to remember your journeys, or to plan your dream vacation! minouette made several journals for gifts, and managed to personalize them with places meaningful to the recipient. 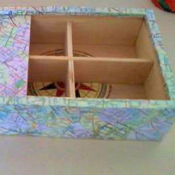 BethanyJoy covered a wooden box with an old map, creating the perfect trinket box for holding her travel souvenirs. What a great place to store shells, ticket stubs, and other tiny items that will remind you of your trip. So save up those maps and use them in your art! To find these and other map related projects, make sure to click on the “map” tag on Craftster.